My in-depth story about the history of Illinois' pension crisis, published in August 2015 by Crain's Chicago Business, won a national award from the Society of American Business Editors and Writers. The piece finished first in the group's explanatory journalism category in its 2015 Best in Business awards. "Illinois is going to have to spend $1 out of every $4 of tax money to support pensions for the next 30 years. This is a well-written, detailed story on a complicated and critically important issue facing residents and investors in the nation’s fifth largest state. A default on the pension would be disastrous for the state and investors. The repercussions extend well beyond state borders. Reporter Dave McKinney expertly combed through the history, talked to all the right people, and delivered an extremely well-organized piece of business journalism that leaves you scratching your head about the process for major, life-altering legislation moving into law. The graphics also sing in this exceptional...piece." I covered the 1997 statehouse press conference where the late Democratic U.S. Senator Paul Simon and the then-Lt. Gov. Bob Kustra, a Republican, formed a new government watchdog group called the Illinois Campaign for Political Reform. 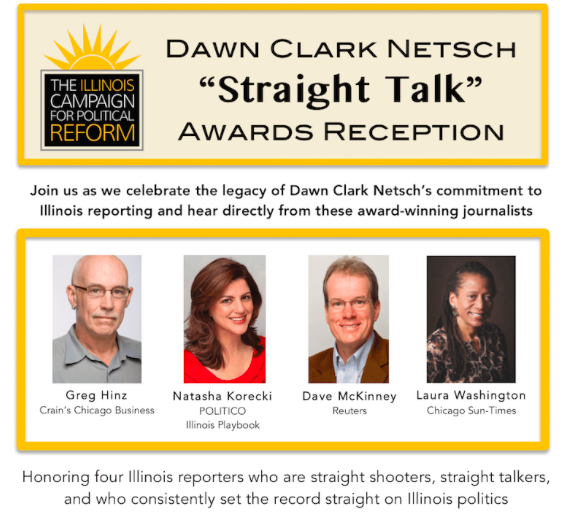 So it was an honor to be recognized by the organization with its "Straight Shooter" award, along with three other terrific journalists: Politico's Natasha Korecki, Crain's Chicago Business' Greg Hinz and the Sun-TImes' Laura Washington. The group praised us for our "unrelenting spirits, tenacious reporting, and honest voices." Here's a recap of the event. Many thanks to my friends in Eastern Illinois University's Journalism Department for this special recognition in October 2016. EIU is where my interest in journalism first took root. From EIU's press office: "Dave McKinney, a Mattoon, Ill., native and a reporter for Thomson Reuters, has been named Alumnus of the Year by the Eastern Illinois University Journalism Department. "The department’s Outreach & Service Committee, which selects the Alumnus of the Year award recipient, said McKinney, who graduated in 1986, has been an exemplary alumnus. "'For many years Dave has given back to the department by working with Eastern’s journalism students as well as with high school students through Eastern’s annual high school journalism workshop,” said Lola Burnham, chairwoman of the committee. "And this year he went above and beyond. "According to workshop director Joe Gisondi, McKinney took a detour from a vacation trip with friends in Missouri to stop in and help schedule speakers, who met with students in Springfield during the camp. "'These high school students were able to visit areas typically off-limits during regular tours of the statehouse, heard from key journalists and assistants to state politicians, and interviewed the sergeant-at-arms for the House,” Gisondi said. ​Hundreds of Illinois politicians share blame for drowning state government in billions of dollars of debt and unfunded pension liabilities. But House Speaker Michael Madigan – a dominant political force for three decades and, soon, the longest-serving speaker in American history – has been the constant in key decisions that created the mess. SPRINGFIELD, Illinois (Feb. 8, 2017) -- As speaker of the Illinois House of Representatives, Michael Madigan has outlasted five governors and is now on his sixth. This year, the Chicago Democrat will become longest-serving state or federal House speaker in the United States since at least the early 1800s. Madigan is to Illinois what his late mentor, Mayor Richard J. Daley, was to Chicago, the state’s great metropolis - a city the political boss once controlled down to the last garbage truck. As speaker for all but two years since 1983, Madigan has directed the fate of key pension, labor and tax laws. As state Democratic Party chairman since 1998, he has shaped the fortunes of his allies and stymied opponents. But if Daley’s Chicago was “the city that works,” a nickname coined during his tenure, Madigan’s Illinois is the state that doesn’t work. The speaker is one of America’s most powerful politicians, presiding over arguably its most dysfunctional state capital. Illinois is beyond broke. It is the first state in eight decades to go without an annual budget, according to the National Conference of State Legislatures. Its bond ratings, the lowest of any state, are near junk status. It is projected to have a budget deficit this fiscal year of $5.3 billion and owes vendors about $10.8 billion in unpaid bills. ​Pension obligations are now projected to consume about a quarter of state operating revenues every year through 2044, raising the specter of steep tax hikes or deep cuts to public services. 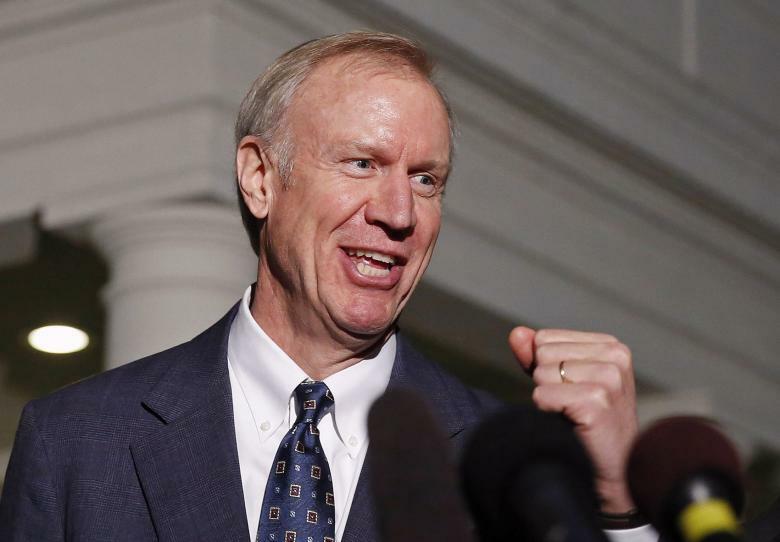 The state’s unpaid bills could reach $47 billion by 2022, Republican Governor Bruce Rauner’s administration has predicted. Hundreds of Illinois politicians share a measure of blame for the fiscal fiasco. Still, as speaker, Madigan has sponsored or voted for every major state law affecting pensions over his three decades in the job and is a leader in budget deliberations every year. No one in modern Illinois politics wields as much legislative power, said David Axelrod, the Chicago-based Democratic political consultant who helped put Barack Obama in the White House. Madigan declined to be interviewed for this report. In the fall of 2015, he shrugged off criticism during rare public comments about his role in the fiscal crisis. WBEZ-FM's "Morning Shift" and WTTW-Channel 11's "Chicago Tonight" invited me to discuss my Reuters' special report on Illinois House Speaker Michael Madigan. ​Click here to watch my appearance on"Chicago Tonight" with correspondent Paris Schutz and here to listen to my discussion with WBEZ morning host Tony Sarabia during his morning show on Chicago public radio. The story also ran on the front pages of the Chicago Sun-Times and St. Louis Post-Dispatch. CHICAGO (Nov. 23, 2016) -- Illinois owes a handful of financial consortia more than $118 million under an obscure program intended to speed up overdue payments to the cash-strapped state's vendors, an analysis of state records shows. Political feuding between Republican Governor Bruce Rauner and Democrats who control the legislature has kept Illinois without a full operating budget since July 2015, contributing to a doubling of the unpaid bills backlog. The amount of overdue bills could reach $13.5 billion, or 40 percent of available operating revenue, when the current fiscal year ends June 30, the Rauner administration has projected. Come fiscal 2022, the backlog is projected to balloon to $47 billion. No other U.S. state defers payments to the extent Illinois does to manage cash flow, credit-rating analysts said. The one-of-its-kind, bill-payment program seeks to avert the nightmare scenario for a state in the worst financial shape in the country: a shutdown of essential services such as employee health insurance, a disruption of prison food supplies or mothballing of state trooper cars in need of fuel and maintenance. “I don’t think there is any other alternative for us,” Illinois Central Management Services Director Michael Hoffman told a legislative panel in May. But it comes at a heavy cost with unlimited late-payment fees now approaching 20 percent in some cases for Illinois' cash-strapped government, whose general obligation (GO) low-investment grade credit ratings are the lowest among U.S. states. The state's negative credit outlook means its $26 billion of outstanding GO bonds could lurch closer to the junk level if the growing unpaid bill pile impairs its ability to provide essential services, affects debt payments and inflates its already huge $130 billion unfunded pension liability. “No other state or business would operate by incurring obligations to its vendors and setting up a third-party payment structure that dramatically inflates the costs of those services,” said Laurence Msall, president of the Chicago-based Civic Federation, a non-partisan government watchdog. Under the Vendor Support Initiative (VSI) program launched last year to replace a similar plan introduced in 2011, state vendors can get paid without delay 90 percent of what they are owed by state-designated financial lenders. When the state finally pays, the vendors get the final 10 percent, while the lenders keep the late-penalty fees. In Illinois, receivables more than 90 days past due accumulate interest at a rate of 1 percent per month. For the lenders, the risk is that the state will not pay up and they will need to fight for compensation in courts, but that has not happened yet. The firms include financial institutions such as Citibank N.A. (C.N) and Bank of America Corp (BAC.N), a distressed debt investor tied to a Rauner campaign donor, and political insiders, including Hillary Clinton's 2008 campaign manager and a former two-term Republican Illinois governor. Lindsay Trittipoe, majority investor of the second-largest consortium, Illinois Financing Partners LLP, told Reuters his group was performing a vital function rather than exploiting the state’s financial miseries. "Our money is flowing into the market, helping the wheels of commerce to keep working," he said. ​During a 10-month period starting in November 2015, four firms qualified by Illinois Governor Bruce Rauner’s administration purchased $1.12 billion in unpaid bills due scores of vendors providing critical goods and services. In return, the firms stood to pocket at least $118 million in state-funded late-payment penalties as of late September. Vendor Assistance Program VAP’s February 2014 disclosure, its latest available, identifies six funding sources and 12 owners, including Citibank N.A. and the consulting firm owned by Democratic political strategist Patti Solis Doyle, Hillary Clinton's 2008 presidential campaign manager. Another VAP investor listed on that document is Manchester Securities, which is owned by billionaire hedge fund manager Paul Singer and had a 4 percent stake. State records show Singer donated $250,000 to Rauner in September 2014, two months before Rauner's election and 14 months before the launch of the Rauner administration's Vendor Support Initiative. Argentina dubbed an affiliated Singer-owned company a "vulture" investor for its hardball tactics in a decade-plus legal battle with the South American nation over defaulted sovereign debt. At one point, the Singer firm seized an Argentine naval training vessel in Ghana to extract money from Buenos Aires. Illinois Financing Partners, LLC's is backed by a $500 million Bank of America commitment, according to an IFP filing with the state in April. CHICAGO (Sept. 23, 2016) -- When Mylan NV recruited food allergy bloggers to learn about its campaign to get allergic shock antidotes into schools, many were eager to join the maker of the EpiPens they carry in purses and stash in book bags to protect their children against potentially lethal attacks. The bloggers, more than a dozen mothers of children with serious allergies, embraced the effort Mylan outlined in a series of "summits" it held for them beginning in 2013. They wrote impassioned posts on blogs shared with tens of thousands of followers on social media. Their personal testimony helped persuade a number of state lawmakers to pass bills to get schools to stock epinephrine injectors, such as the EpiPen, according to legislators and others familiar with the lobbying effort. During the same period, the company was marking up its EpiPen to more than $600 per twin pack, six times the 2007 price, creating a burden for many of the bloggers' followers, other parents of children whose lives are threatened by bee stings and peanuts. At least four of the bloggers told Reuters they believe Mylan took advantage of their goodwill. Some have joined public criticism of those price hikes. "I personally believe that Mylan held the summits to gain blogger trust and then used those bloggers to spread word about their initiatives. They raised prices while those initiatives gained traction," Ruth LovettSmith, a former food-allergy blogger from Massachusetts who attended three summits, said in an email. Mylan spokeswoman Lauren Kashtan declined to comment on the criticism. But in an email, she said the company regretted that it had not anticipated "the potential financial issues for the growing minority of patients" whose EpiPens are not covered by insurance or a patient assistance program. Mylan now offers coupons to more families to cover out-of-pocket costs and said it would soon release a half-price EpiPen. Kashtan also said the blogger summits served a worthy purpose. "Mylan aimed to provide access to information, resources and expertise about anaphylaxis and life-threatening allergies," said Kashtan, who represented the company at four summits. "We are proud to have brought together such a passionate and dedicated group of advocates." Chief executive Heather Bresch was blasted Wednesday at a hearing before U.S. lawmakers who, along with prosecutors in several states, are investigating the price hikes. EpiPen sales exceed $1 billion a year and command more than 90 percent of the market. The effort to get epinephrine injectors into schools is a point of pride for Mylan, which has credited its alliances with advocates for its success. "We have collaborated with government officials, leading advocacy organizations, parents, caregivers and healthcare professionals to successfully champion legislation and policies," Mylan said in a 2015 report on its social responsibility efforts. LovettSmith, whose son has nut allergies, went to her first Mylan blogger summit in January 2013 at a boutique midtown Manhattan hotel overlooking the Empire State Building. It was the first of at least four summits, each involving about 15 bloggers, some of whom attended more than one event. They wrote about being treated to three-course dinners featuring pan-seared yellow fin tuna or marinated grilled hanger steak. At a 2014 summit at the company's Canonsburg, Pa., headquarters, Mylan brought an outside communications consultant to help the women polish their blogs, advocate to policymakers, practice on-camera television interviews and speak at public events, participants told Reuters. Homa Woodrum, a lawyer in Las Vegas whose 8-year-old daughter relies on EpiPens for nut and oat allergies, attended that summit. But she skipped an invitation to a May 2015 event at California's Disneyland, uncomfortable with the shift in venue to a resort. Governor Bruce Rauner greets House Speaker Michael Madigan and Senate President John Cullerton, his two Democratic legislative nemeses, after delivering his 2016 State of the State address. SPRINGFIELD (Jan. 27, 2016) -- Illinois Governor Bruce Rauner refused to step away from his stalled legislative agenda on Wednesday while insisting that a spending deal remains within reach, but his words appeared to leave his Democratic rivals unmoved. Republican Rauner and the Democratic-controlled legislature have been locked in a budget stalemate for nearly seven months. Chicago Mayor Rahm Emanuel lays out plan to equip 700 more police cars with Tasers in response to the police-involved shooting deaths of Quintonio LeGrier and Bettie Jones. CHICAGO (Dec. 30, 2015) -- Chicago police will get new equipment and training to help them defuse tense situations and limit their use of lethal force, Mayor Rahm Emanuel said on Wednesday, following weeks of protests calling for him to resign over his handling of fatal police shootings. The number of Tasers, or electric stun guns that are generally not lethal, for the police department will be doubled to 1,400 so that every patrol unit that goes out at night has one, Emanuel said at a news conference. DETROIT (Dec. 15, 2015) -- Nowhere in America bulldozes derelict homes with Detroit’s ferocity, as the city that has become a byword for U.S. urban decay seeks to engineer a recovery by tearing itself down. 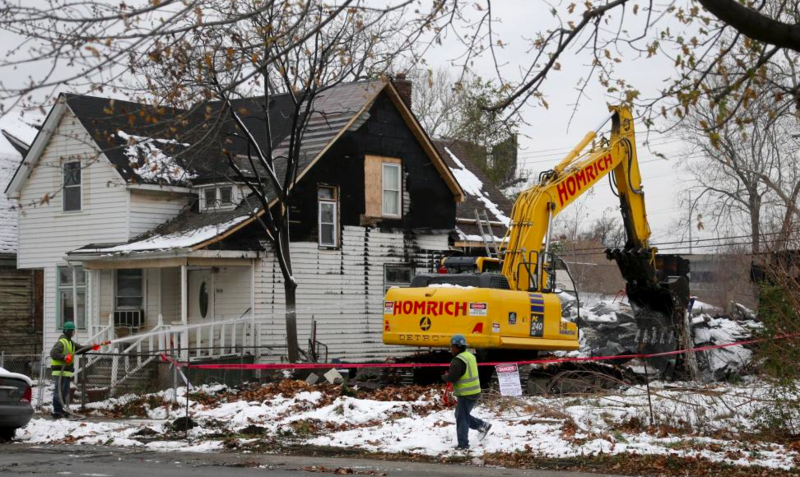 A year after the city exited the biggest-ever U.S. municipal bankruptcy, a plan to demolish half of its nearly 80,000 blighted or deteriorating structures -- nearly one in three city buildings -- is showing some signs of success. The number of fires - often caused by arson attacks on abandoned homes – dropped in October from a year ago, and deeply depressed property values have ticked higher in areas close to demolitions. The aim of the program is to stabilize home values and reduce foreclosures as the city of 680,000 people struggles with emptying neighborhoods, high crime and one of the worst unemployment rates in the country. During a late-fall visit to Detroit, I did a ride-along in an area on the city's northwest side known as Brightmoor with John George, founder of the Motor City Blight Busters. Using thousands of volunteers and relying on private donations, George explains in this video how his non-profit has cleaned up an entire, blighted neighborhood. Gov. Bruce Rauner fields questions after a budget meeting in Springfield with the legislative leaders. CHICAGO (Oct. 24, 2015) -- To see the fickle fiscal state of affairs in cash-strapped Illinois, you need look no further than how the musical acts Styx, Sammy Hagar and Hank Williams Jr got paid for performing at the state fair in August, but the woman who sculpted the event’s life-sized butter cow did not. The Illinois Pension Disaster: What Went Wrong? For more than a quarter-century, governors and state legislators, Republicans and Democrats alike, made a series of financially toxic moves in the pension systems for state employees and public school teachers. Proposals to fix the perennially underfunded pensions were based on botched calculations—or no calculations at all—and were driven by misguided rationales that weren't fully vetted. Everyone was to blame, yet few accepted responsibility. Even the public-sector unions that stood to lose the most sometimes embraced those choices. In separate interviews with Crain's, one Illinois governor pointed the finger at his predecessors for bad decisions, while an earlier governor said those who followed him messed things up. Cumulatively, those poor decisions more than quintupled the $20 billion deficit that existed in 1995 to the current $104.6 billion, leaving a seemingly insurmountable emergency with no fix in sight. Read more here. And to listen to my Aug. 7, 2015, WGN-AM radio interview about this piece, click here. 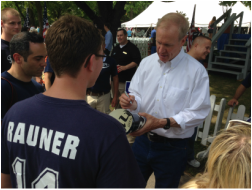 If Bruce Rauner’s vision of shaking up Springfield meant making a lot of noise, his first six months have been a rousing success. But if the goal was to get something substantive actually, well, done, Illinois’s new governor has yet to impress, accomplishing less in his first spring in power than any predecessor since before fellow Republican Jim Edgar took office in 1991. Here’s how well, at presstime in late June, he has delivered on seven key promises he made during the election. Read more h﻿ere. And to listen to my July 9, 2015, WGN-AM radio interview about this piece, click here. 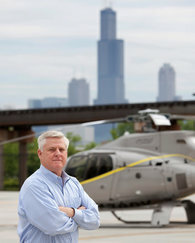 CHICAGO — The only complaint Mike Conklin ever received from his time helicoptering President Bill Clinton around in Marine One came from the White House chief usher, who politely asked if there were some way to quit strafing the flowers with wind from the rotors. Are Scientologists targeting Illinois mental health laws? The oft-maligned Church of Scientology needs whatever friends it can get after the searing HBO documentary Going Clear. Followers still have at least one in, of all places, Springfield. State Rep. Mary Flowers, a Democrat whose district stretches from the Auburn Gresham neighborhood to Countryside in the southwestern suburbs, is sponsoring legislation that bears Illinois Scientologists’ imprint. The resolution, picking up where she left off two years ago with a similar bill, would drag the state into a debate over the American Psychiatric Association’s definition of mental illnesses. Scientologists have long contended that psychiatry is essentially bunk. (Remember Tom Cruise’s 2005 rant against antidepressants?) According to the church’s website, its members founded the Citizens Commission on Human Rights in 1969 to protect people from “abusive or coercive psychiatric practices.” How seriously do they believe in this abuse? The group’s museum is named Psychiatry: An Industry of Death. "Now what would you expect? After a guy like you has written all of those articles about me for 14 months, and there are screaming headlines about what a bad guy I am, and then they take a poll and say, 'How's old George doing?'" "Obama joked in later years that only one reporter, Dave McKinney of the Chicago Sun-Times, paid him any attention at all. 'And McKinney only talked to me to be nice,' Obama said."